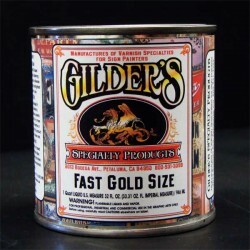 Buy Gilding Sizes for sale here. Gilding Sizes attach Gold Leaf, Precious Leaf and Aluminum, Imitation Brass and Copper Metal Leaf. We offer Oil Based and Water Based Gold Sizes which are Gold Leaf Adhesives. There are Gilding Sizes listed below.